Charles Doherty, who heads up the catalogue production design team at Dynamic Office Solutions, first started work on a pair of new marketing concepts in April last year. After a gestation period of exactly nine months, Charles and the team are celebrating the simultaneous birth of their two babies – a lavish 204-page main catalogue and a prestige 40-page mini catalogue price list. 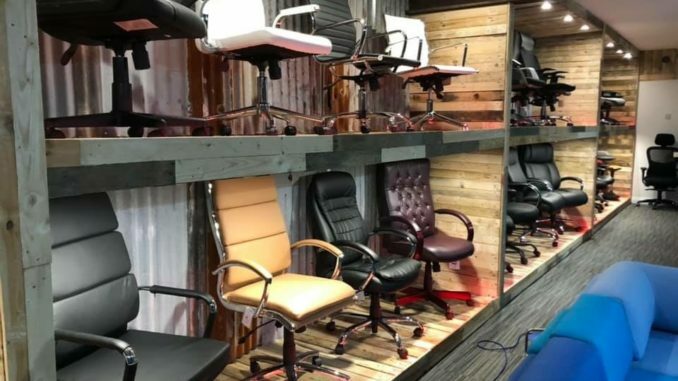 Dynamic is also unveiling a unique showroom at its central UK location. Affectionately nicknamed ‘The Lumber Yard’, the showroom leans heavily on the use of recycled eco-neutral timber and building materials to create an expression of Dynamic’s approach to business. Quality carpeting and lighting complete the project. It is a one-off look that sees Dynamic designers taking their inspiration from the shabby chic and eclectic design school for the Northampton HQ resource. Dynamic MD, Carl Verlander, commented: “We wanted to create a place that is unique to us. A showroom experience that is memorable because it is so different. We discounted the usual sterile, vanilla showroom look from the start.